What happens when a zombie falls in love with a woman and feelings begin to return to an undead being? This is the question that Warm Bodies looks to answer. The zombie, known only as R spots Julie and is attracted to her. Having just killed her boyfriend and kidnapped her, he tries to make amends and the two slowly grow close. I loved Rob Corddry in this movie as fellow zombie M. His presumed best friend relationship with R is done quite well, given they’re non-communicative zombies. Steve, a mild-mannered HR manager is bitten by a zombie mosquito and therefore, he’s only “a little bit zombie”. Complicating matters is Steve’s wife-to-be, who’s gone all bridezilla on their upcoming wedding. That’s a pretty funny premise to me and although it’s not the greatest movie out there, it is a unique twist on the zombie film. According to Shaun, the safest place to take refuge in the middle of a zombie uprising is at the local watering hole. So, Shaun and pal, Ed, are charged with rounding up Shaun’s mom and girlfriend in an attempt to make it to the shelter of the Winchester Pub. After all, that’s where drinks, food, and good times can be had. This film launched the careers of Simon Pegg, Nick Frost, and others and is the first of the Three Flavours of Cornetto Trilogy (Hot Fuzz and The World’s End being the other offerings). Ash Williams (Bruce Campbell) is back to fight the undead and this time, he’s got a boomstick (a shotgun) and chainsaw (affixed to his arm, of course) to keep him company. The third and final film in The Evil Dead franchise (as of now) is a cult favourite for its catchphrases, humour and cheesiness. 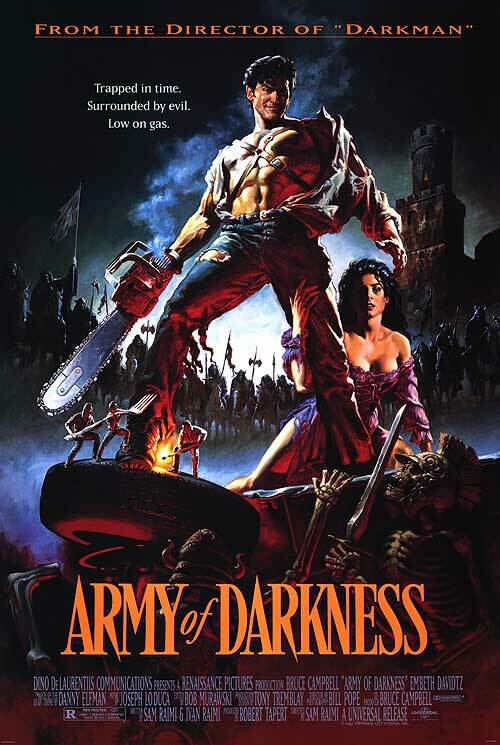 There are plans for an Army of Darkness 2 to be released sometime in the future, with Campbell returning to his titular role of Ash. Directed by Peter Jackson (yes, the same Peter Jackson that has since gone on to make the Lord of the Rings and Hobbit trilogies), this zombie outbreak is caused by the dreaded ‘Sumatran Rat-Monkey’, which infects the mother of Lionel Cosgrove. Cosgrove now must care for his undead mother, while fending off his uncle who wants the family estate. The flick is full of wonderful gore, so much so that the uncut version is still banned in Germany. The best part of Zombieland is the “rules” the viewer learns along the way, as Columbus, Tallahassee, Wichita, and Little Rock pursue freedom, Twinkies, and the Pacific Playland amusement park. It all leads to a final showdown between the weary survivors and the deadly zombies at the theme park, where creative kills come in spades. Although there was talk of a sequel and even a TV series, neither came to fruition, although a pilot was filmed in 2013 with the series later being rejected. Which movies would you suggest to the Sip Advisor to get his zombie viewing on? That way I can be as brainless as the undead beings I’m watching! This is quite the process to make this shooter. Mix the Vodka and Lime Juice together before straining into a shot glass. Then, add drips of Irish Crème, which will curdle thanks to the Lime Juice and form the basis of the guts. Finally, add a couple drips of Grenadine for the bleeding effect. That’s what’s supposed to happen, but as you can see above, I had no such artistic luck. 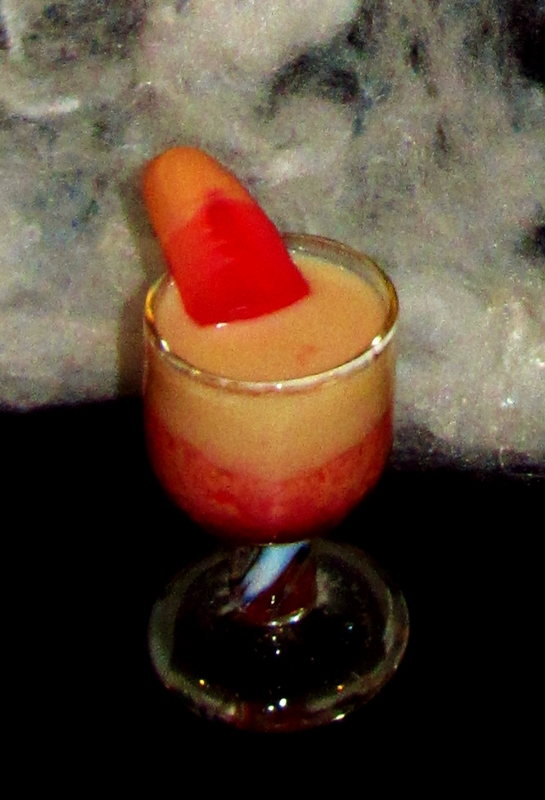 Still, things turned out okay and throw in a Candy Finger to complete the project. This entry was posted in Shots & Shooters and tagged A Little Bit Zombie, Army of Darkness, Ash Williams, Bailey’s Irish Crème, Braindead, Bruce Campbell, Candy Finger, Dead Alive, grenadine, lime juice, Nick Frost, Pacific Playland, Peter Jackson, Rob Corddry, Shaun of the Dead, Shooter, shot, Simon Pegg, Three Flavours of Cornetto Trilogy, Twinkies, vodka, Warm Bodies, Zombie Guts, Zombie Movies, Zombieland by Daniel Wilson. Bookmark the permalink.